I had these images on my computer, so I finally decided to make a "Totally Looks Like" meme on my Cheezburger profile. Please give it an upvote if you like it. The painting is "God the Geometer," the medieval depiction of The Creator using a compass to design a swirling universe with complex edges. The Fractal is a version of the Mandelbrot Set, a visualization of the pattern that arises from the famous equation formulated by Benoit Mandelbrot. 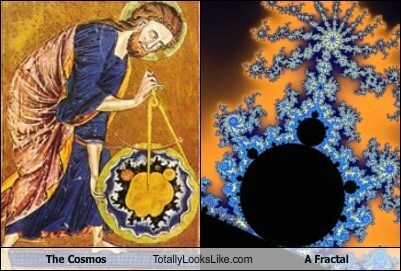 Somehow, the ancient genius who painted the image of the Universe was able to accurately depict the complex, recursive quality of Reality that can now be modeled through fractal geometry... hundreds of years later! I think the term "Evolution" is misleading when talking about the process of natural selection. It implies that Life is "improving", when it is really just a process of continual genetic change & adaptation. Whether the process leads to something "better" or "more advanced" is a matter of opinion. Anyway, some people don't even believe that natural selection is a real phenomenon & refuse to believe that we could have "evolved from monkeys". These people choose to remain ignorant of the nature of life- despite evidence from things like the fossil record, or mutations observed in short-lived animals like fruit flies. When I saw this picture of a baby hooked up to a machine, it reminded me of the Sentinel robots from The Matrix. I made this animation awhile ago, but I just uploaded it to Memebase. Give it an upvote, if it makes you fear for the future of humanity! The robots are trying to latch onto newborn humans!!!! I've read several versions of the Tao Te Ching over the years, & Lao Tzu's wisdom is as applicable today as it was thousands of years ago. This is an excellent quote by the ancient sage. 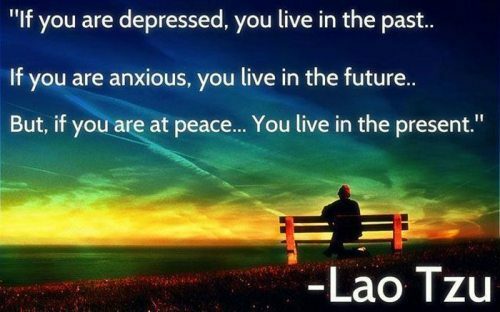 It is important to bring your mind back from it's mental wanderings... & be aware of NOW! but if you are at peace, you are living in the present." This moment is the only one that we ever really have. If we are not in it completely, we are not fully experiencing life & the world around us. I'm actually a very productive person. However, I still have an inner procrastinator that would much rather do nothing & put everything off until later. Thankfully, demands in work & life have helped me develop the ability to motivate myself to get things done. The deep realization of my mortality, that each day could be my last, also helps me to stop waiting to do things. This is a funny logo, that some procrastinator out there actually got around to working on- but (of course) it's unfinished! 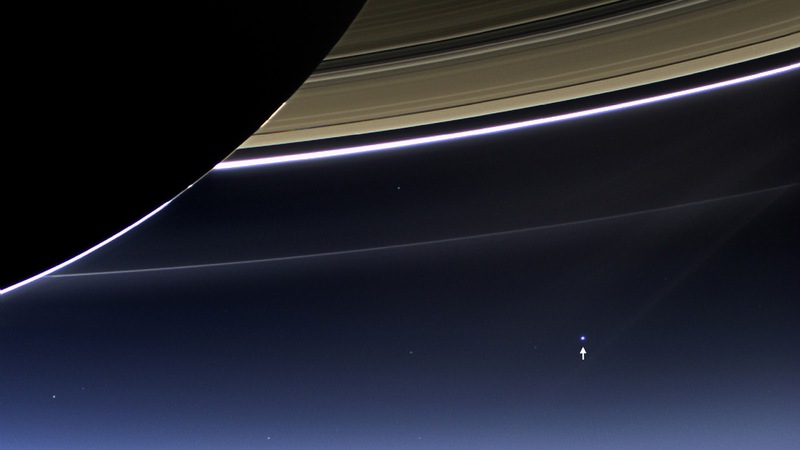 NASA released this awesome shot of the Earth, the pale blue dot, as seen from the Cassini spacecraft near Saturn. 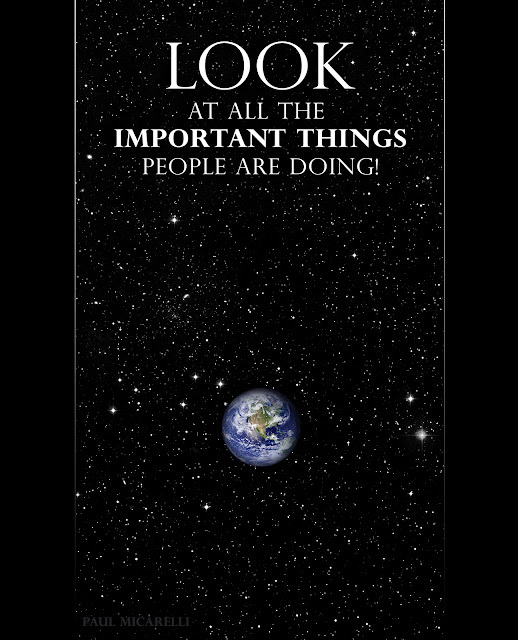 When our problems on Earth seem overwhelming, it's good to remember this cosmic view & put things in perspective. The future may not smell great- but it LOOKS awesome!!!!! 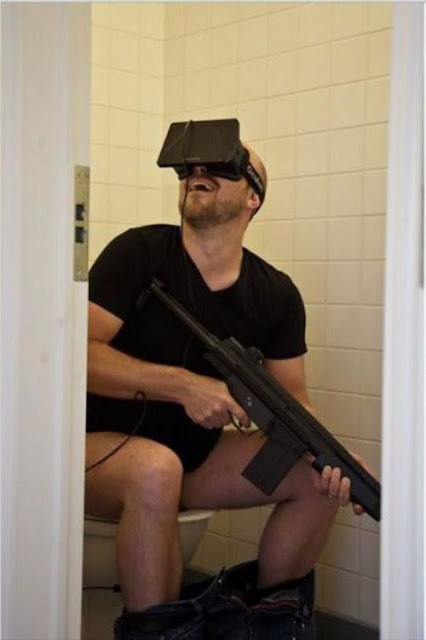 The VR headset this guy is wearing is the Oculus Rift, the most advanced virtual reality hardware out there. Here is a 2-D demo of what kind of software is being created for it. This weekend I was eating breakfast outside in the summer breeze. 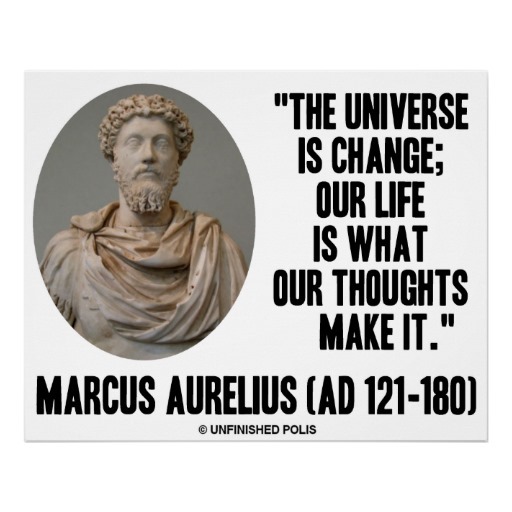 While listening to sounds of nature, I was reading 'Meditations' by Roman emperor Marcus Aurelius. Living it up! Haha. He was like a Western Zen master who had many great quotes & insights. The book is deep, but written in brief, easy to read sections. I downloaded the e-book for free. This is my last post about my vacation in Cape May... I had a great week & got alot of good photos, but I"ll try & get back to blogging about other things. I wanted to post some of the amazing sunsets I got to see each night. The house that my family rents overlooks the Delaware Bay facing west, so we get to view these beautiful evening vistas over the water. We also get to see pods of dolphins from the house every day, going into the bay in the morning & back out to sea in the evening. Watching the sunsets is a ritual that people along the shore patiently observe, & these pics show that it's worth the wait. While I was on vacation in Cape May last week, I went with my parents, my sister, & her kids to The Wetlands Institute in Stone Harbor, NJ. I haven't been there since I was young, many decades ago! Haha. They now have many engaging features for both kids & adults. My nephews loved it, and we all enjoyed the interesting animals & exhibits. We sat in on a presentation about sea creatures such as shellfish & echinoderms (sea cucumbers, urchins, sea stars, etc). The speaker had a bunch of the live animals in bins w/ water, for the kids to look at afterward. My favorite animal was definitely the octopus they had in the aquarium room. I could have sat watching it all day as it swam around, changing form & color. The enthusiastic & helpful staff also helped me solve a mystery beach find! Last week, I had an awesome vacation in Cape May. One day, after seeing landmarks with the family all morning, I went wine tasting with my brother & his girlfriend. We went to the Cape May Winery & had an excellent afternoon. There weren't many people there at the time, so we had the place almost to ourselves & chatted it up with the bartenders as we tried their wines. The winery is very nice, with a few different bar areas to test their wines. They have a patio overlooking the vineyard that we sat out on for awhile, snacking & drinking once we finished our taste tests. You get to try six wines for $6, but the bartenders loved us, so we got a few extra splashes to try. I really enjoyed almost all the wines I tried. Red & white wines are sometimes either too dry or too sweet for my tastes. However, Cape May Winery has some delicious wines in all varieties. My brother & I had a scorecard to grade each wine on a 1-10 scale. I think my top 3 picks were Cape May Red, Cape May Rosé, & the Cape May Cabernet. All their wines were very good, though. I was even into some of their white wines, like the Isaac Smith Albariño that tasted like summer in a glass! Although I love wine, this was actually my 1st trip to a winery & wine-tasting. Luckily it turned out to be a top-notch establishment, with many delicious wines! Last week, I was on vacation at the beach in Cape May, NJ. I went to the NJ Wetlands Institute with my family & brought a bag with the strange items found on the beach. After asking & stumping a few of the people who worked at the institute, I finally got an answer from their resident expert. It turns out the mysterious remains were the teeth of a black drum fish! 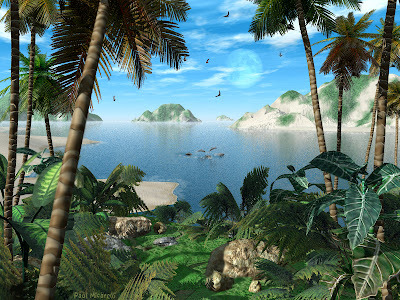 This is a tropical scene of a peaceful lagoon, with distant animals giving life to the tranquil scene. 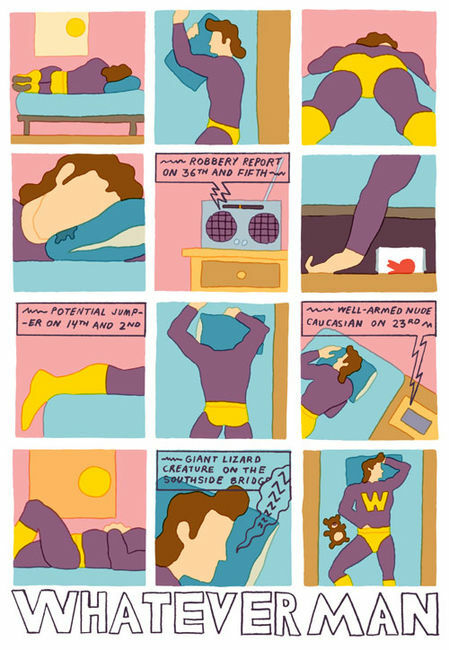 Judging by this comic, I definitely have what it takes to be a superhero... just like Whatever Man! 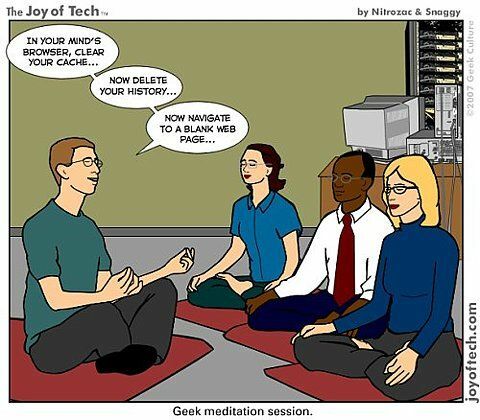 After my last post about zazen, I thought this was a funny "techie" version of meditating. "For zazen, a quiet room is appropriate. Drink and eat in moderation. Let go of all involvements and let myriad things rest. 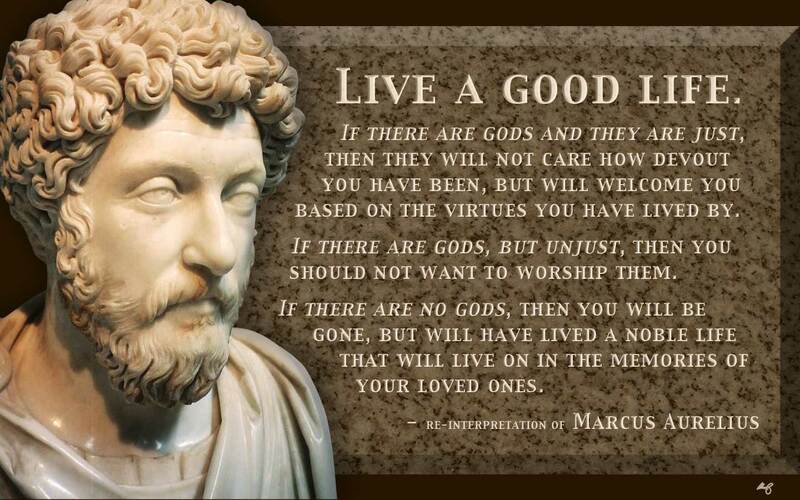 Do not think good or bad. Do not judge right or wrong. Stop conscious endeavor and analytic introspection. Do not try to become a buddha. " 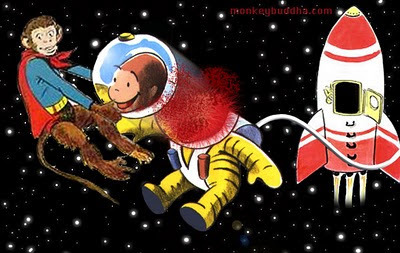 To follow up on my last post, about compassion toward lab chimps, in a deplorable way... here's an image I made of a Curious George getting his head ripped off by Superman's monkey, Beppo. The End of Experimental Lab Chimps? It's good to see people trying to cut back on the systemic torture of other living beings. Used In Medical Research Labs Across U.S. Although I'm definitely not becoming a vegetarian anytime soon, I do feel empathy for animals that are experimented on, killed for food or used to make products. Any creature with a nervous system & sense organs are experiencing realities very much like ours. The only real difference is that they cannot directly share their experiences with us through language or other communication, yet. People can easily identify with our physical similarity to other primates & with dogs, cats, horses, etc because they are seen as pets. However, human beings are slowly working toward recognizing the consciousness of other species, also. Even if animals are still bred for consumption, that doesn't mean they have to be tortured while they are still alive. At the same time we release chimps from cages, we are also locking human beings inside the cages we call "prisons," in record numbers- with almost a quarter of them from drug offenses alone. Like biomedical research, the prison industry is a business-for-profit that has gone wild, no pun intended. As a graphic artist & someone who loves to learn about science, I thought these designs were really clever. My brother informed me that Doink the Clown, a pro wrestler, has died. 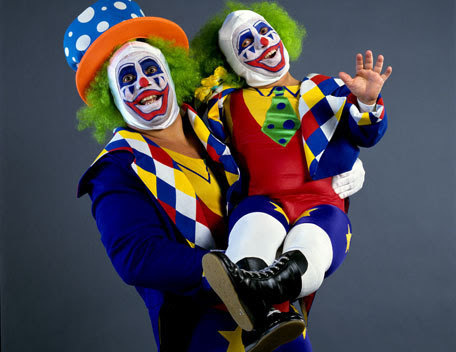 I used to watch some wrestling back in the day, & I remember the iconic clown duo, Doink & Dink. They definitely do not help my mild aversion to clowns.